It is easy to tell that an animal is a bird. If it has feathers, it is one of the more than 8,600 kinds of birds in the world. Birds can also be recognized by their bills, wings, and two legs, but feathers are what make them different from every other animal. Scientists are not sure when feathers first appeared on animals. They might have begun as feather-like scales on some of the dinosaurs. 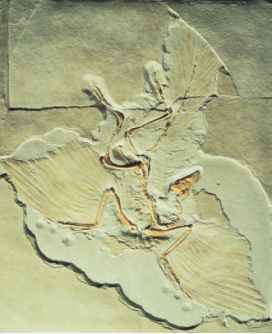 In 1861, fossils of a feathered animal, Ar-chaeopteryx (ar-key-OP-tuh-rix), were found in Germany. These are the first animals known to scientists that were covered with feathers. These crow-sized animals with heads like lizards lived on the Earth about 150 million years ago. Feathers in most birds' wings and tail help them fly. 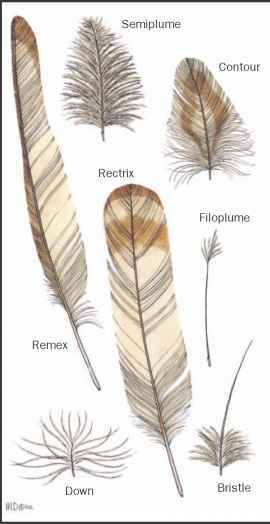 Each of these flight feathers has a stiff shaft that goes from one end to the other. Flight feathers are light, but they are surprisingly strong. Birds that can fly can escape enemies and get to food sources and nesting places they wouldn't be able to walk to. Feathers have many other uses in addition to flight. The outer feathers on a bird's body give it color and shape and help to waterproof the bird. Outer feathers with patterns are useful for camouflaging some birds, and colorful feathers send messages. For example, male birds show off their bright feathers to impress females or wave them as warnings to others. Downy inner feathers trap air to keep the bird warm. 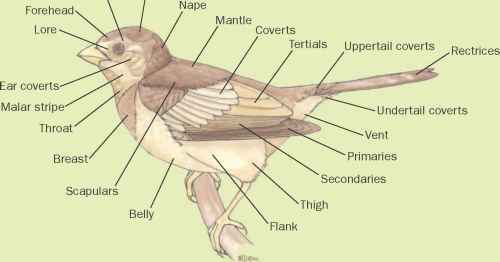 Scientists have names for different types of feathers and also for groups of feathers according to where they grow on a bird's body. Most birds' bodies are built for flight. Air sacs in their chests and hollow bones keep them light. 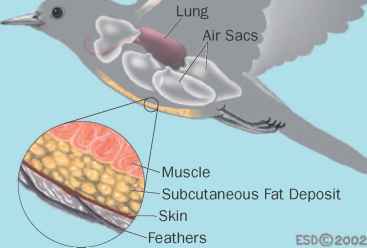 They have powerful chest muscles that move their wings. The wing and tail feathers are tough, and birds can turn some of them for steering. A bird usually shuts its wing feathers to trap the air as its wings go down. This lifts the bird into the air and pushes it forward. Then, as it raises the wings, it fans the feathers open to let the air through. How birds fly depends somewhat on the shape of their wings. Vultures and seabirds have long, narrow wings that are great for soaring high on air currents or gliding over the ocean. Songbirds have short, broad wings that are made for flapping as the birds fly among trees. Falcons have narrow, pointed wings that curve backward. These wings help them fly fast and steer well. But all birds flap their wings at times and glide at other times, depending on what they are doing and how the wind is blowing. Some birds use their wings in unusual ways. Hummingbirds can flap their wings about fifty times every second. This allows them to hover at one spot as they lap nectar from flowers. Flipper-like wings help penguins to "fly" through the water, and even ostriches use their wings to keep their balance as they run. The wing of a bird is rounded on top and flat on the bottom, similar to the wing of an airplane. This shape is what gives the bird the lift it needs to stay up in the air. Birds take off and land facing the wind. Small birds (up to the size of pigeons) can jump up from the ground and fly right off into the air. Larger birds have to jump off something high or run along the ground or the water to get going. (about 2 grams). But all birds have many things in common besides having feathers. They have bills, two legs, a backbone, they are warm-blooded (keep an even body temperature), and they lay hard-shelled eggs. Birds have many different shapes. Wading birds such as flamingos have long necks and long legs. Eagles have short necks and legs. But both kinds of birds are able to find their food in the water. Falcons and penguins have sleek, torpedo-shaped bodies that are perfect for catching speedy prey. Turkeys' heavier bodies are just right for their quiet lives in the forest searching for acorns and insects. 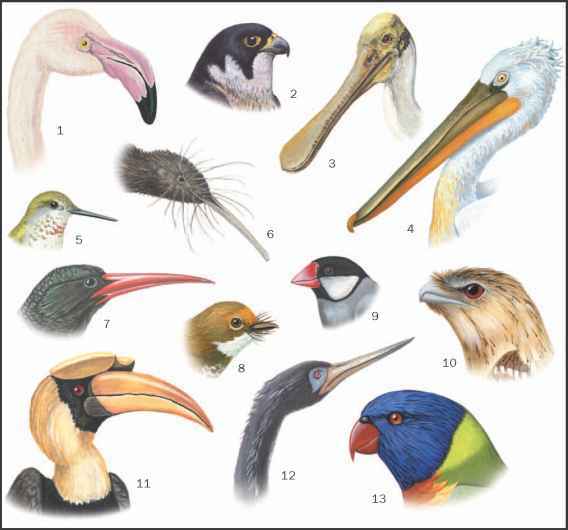 Bird bills come in a wide variety of shapes. They use their bills to gather food, build nests, fix their feathers, feed their young, attract mates, and attack their enemies. The type of food a bird eats depends on its bills' shape. For example, the sturdy bills of sparrows are good for cracking seeds, and hawks' hooked beaks are perfect for tearing up prey. 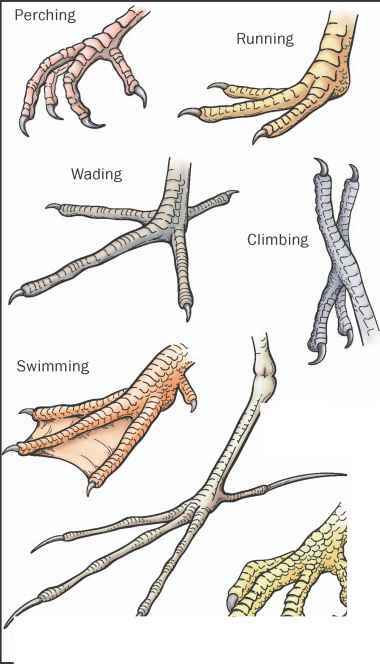 Bird legs and feet fit their many different lifestyles. For example, hawks have sharp talons for hunting and ducks have webbed feet to help them swim. Some of the birds that spend most of their lives in the air or on the water are not good at walking. Most birds have four toes, but some have three, and ostriches have only two. For most birds, sight is their best sense. They can see much better than humans, and they can see in color, unlike many mammals. A bird's eyes are big and are usually set on the sides of its head. The eyes focus independently, so that the bird sees two different things at the same time. This gives the bird a very wide view and helps it to watch for predators in most directions. Most birds cannot roll their eyes, but they can turn their heads farther around than mammals can. Owls and other birds of prey have forward-facing eyes that usually work together. This helps them judge distance as they swoop down on prey. Birds have a good sense of hearing—they can hear about as well as mammals. The sound goes in through a little opening near each eye. The holes are usually covered with feathers. They lead to the bird's middle and inner ear, which are very sensitive to sounds. Because owls hunt at night, hearing is especially important to them. Some owls have a disc of stiff feathers on the face. The disc catches sounds, such as the squeaks of a mouse, and leads them to the ears. 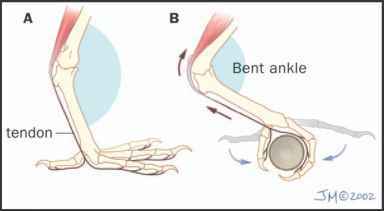 Birds have many nerve endings, which shows that they have a good sense of touch. They can also feel pain, hot, and cold. Some long-billed birds have very sensitive bills and can feel their prey in muddy water. Most birds' sense of smell seems to be poorly developed. But kiwis, turkey vultures, and several other birds are able to find food by sniffing it. Although birds do not have many taste buds on their tongues, they can often taste well enough to avoid eating harmful foods. do not have a heavy jaw with teeth to grind their food. 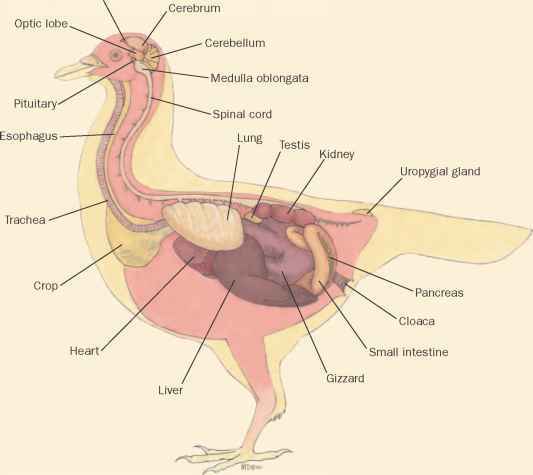 Instead, it is ground up in a muscular stomach called a gizzard, and they swallow gravel to help with the grinding. To get the energy they need for flight, birds digest their food quickly. Their fast digestion also keeps them from being weighed down for long by the food they have eaten. A birds' skeleton is strong, even though it light. Many of the bones are hollow, and some of them are joined together to give the skeleton extra strength. (Loons and other diving birds have some solid bones to help the birds sink in the water.) 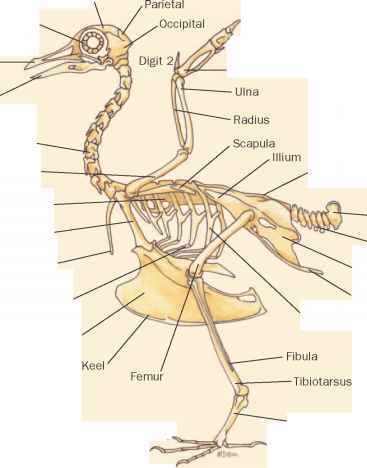 The breastbone, or sternum, of a flying bird has a part called the keel. The bird's big flight muscles are attached to the keel. What looks like a backward-bending knee on a bird is really its ankle. The bird's knee is hidden high up inside its body feathers. Birds are warm-blooded, which means their bodies stay at an even temperature no matter how warm or cold it is outside. They make their own heat from the food that they eat. Some birds cope with cold weather by growing extra feathers or a layer of fat, fluffing their feathers to trap more air, and huddling together with other birds. When birds can't find enough food to keep warm, they fly to warmer places. In hot weather, they cool down by panting, swimming in cool water, sitting in the shade, and raising their wings to catch a breeze. Singing is one of the most important ways that songbirds communicate. Birds do not sing just because they are happy. Instead, a male songbird sings to say that he "owns" a certain territory, and he warns birds of the same species to stay away. Songbirds do not have to see each other to know who is nearby. Birds can recognize the songs of their neighbors, because each bird of the same species sounds a little different. Male birds show off to females by singing the most complicated songs they can. Often the best singers are the strongest, healthiest males. When a female songbird hears her mate singing, her brain tells her body to make hormones (special chemicals). These hormones make eggs start to grow inside her body. parade and show off bright feathers or blow up colorful throat sacs to impress females. When a bird has found a mate, it is nest-building time. Birds lay their hard-shelled eggs where they can be protected from predators and rain. There are many different kinds of nests. Some birds lay their eggs right on the ground or on the sides of cliffs, some use tree holes or burrows, and some weave complicated stick nests. A few kinds of birds even bury their eggs in mounds of soil and leaves. Eggs come in many different sizes and colors. Those laid on the ground usually have camouflage colors, and eggs laid in hidden places are often white. The female bird usually incubates the eggs (keeps them warm), especially if she has duller, harder-to-see feathers than the male. Sometimes males and females take turns, and occasionally the males incubate by themselves. Some birds, such as cowbirds, lay their eggs in the nests of other bird species and let the other birds incubate them. There are two main types of newly hatched birds. Young chickens, ducks, geese, turkeys, and ostriches are precocial (pre-KOH-shul). Precocial chicks are covered with down feathers and can run or swim after their parents soon after hatching. Before long, they learn to find their own food, but the parents usually protect them for a while longer. 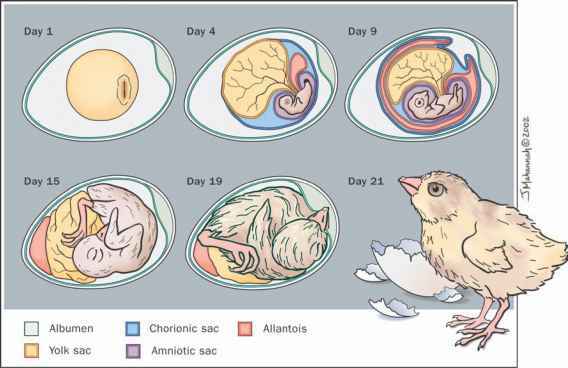 Altricial (al-TRISH-ul) birds are helpless when they hatch. Songbirds, seabirds, owls, parrots, and woodpeckers are some of the altri-cial birds. They are naked, blind, and weak, and they need to be fed by adults at least until they leave the nest. In order to live in a habitat, birds need food, water, and shelter (such as a hedge to hide in). At breeding time, they also need a place to raise their young. Many different kinds of birds can live in the same habitat because they eat different foods and nest in different places. Some birds, such as crows, can often adapt to changes in their habitat, but other birds are very particular and have to leave if something changes. Birds have to have their feathers in flying shape at all times so that they can escape predators. Well-cared-for feathers are also necessary for keeping the birds warm and waterproof. Birds often have to stop what they are doing and take time out to fix their messed-up feathers. Sometimes they start with a bath. But they always finish by preening. To preen, the birds nibble along each feather to remove dirt and tiny pests. Most birds also get oil on their beaks from a gland near their tails. They spread the oil on each feather and straighten it by zipping it through their beaks. The oil keeps the feathers from drying out and waterproofs them. When a feather gets too worn, it either falls out or gets pushed out by a new feather growing in its place. they will be able to find the food they need. Their bodies are programmed to tell them that when the days start getting shorter, they have to eat more so they will have enough fuel for the journey. They follow the same migration routes year after year, and they know the general direction they should go and where to stop. The migrating birds are guided by the stars and by the direction the sun moves across the sky. Birds have a built-in compass and are able to follow magnetic fields in the earth. Some birds also rely on landmarks such as rivers and mountains to follow, and some may use sounds and smells to help them find their way. learned about flight from birds, they eat birds and their eggs, and they keep birds as pets. They appreciate the way birds eat insect pests and weed seeds, and they enjoy watching and listening to birds. Sometimes people kill the birds that eat fish or destroy their crops. People have also harmed birds unintentionally by polluting their habitats or turning them into farms and cities. Humans now take the disappearance of birds from an area as a warning—there may be harmful poisons in the air or water. Many people are working hard to preserve natural places for birds and all wild animals. They are also having some success with fixing habitats that have been destroyed, but fixing them is much harder than preserving them in the first place. Johnson, Jinny. Children's Guide to Birds. New York: Simon & Schuster, 1996. MacKay, Barry Kent. Bird Sounds. Mechanicsburg, PA: Stackpole Books, 2001. Markle, Sandra. Outside and Inside Birds. New York: Bradbury Press, 1994. Perrins, Christopher M. The Illustrated Encyclopedia of Birds. New York: Prentice Hall Press, 1990. Proctor, Noble S., and Patrick J. Lynch. Manual of Ornithology, Avian Structure and Function. New Haven, CT: Yale University Press, 1993. Reid, Struan. Bird World. Brookfield, CT: The Millbrook Press, 1991. Rupp, Rebecca. Everything You Never Learned About Birds. Pow-nal, VT: Storey Communications, Inc., 1995. Sibley, David Allen, Chris Elphick, and John B. Dunning, Jr., eds. National Audubon Society: The Sibley Guide to Bird Life & Behavior. New York: Alfred A. Knopf, 2001. Able, Kenneth P. "The Concepts and Terminology of Bird Navigation." Journal of Aviation Biology 32 (2000): 174-182. Berger, Cynthia. "Fluffy, Fancy, Fantastic Feathers." Ranger Rick ( January 2001): 2-10. Greij, Eldon. "Happy Returns: Landing Safely Is Every Bit as Tricky as Flying." Birders World (February 2003): 58-60. Kerlinger, Paul. "How High? How High a Bird Flies Depends on the Weather, the Time of Day, Whether Land or Water Lies Below—and the Bird." Birder's World (February 2003): 62-65. Miller, Claire. "Guess Where They Nest." Ranger Rick (March 1996): 19-27. Pennisi, Elizabeth. "Colorful Males Flaunt Their Health." Science (April 4, 2003): 29-30. "Act for the Environment." National Wildlife Federation. http:// www.nwf.org/action/ (accessed on May 3, 2004). "All About Birds." Cornell Lab of Ornithology. http://www.birds .cornell.edu/programs/AllAboutBirds/ (accessed on May 3, 2004). American Bird Conservancy. 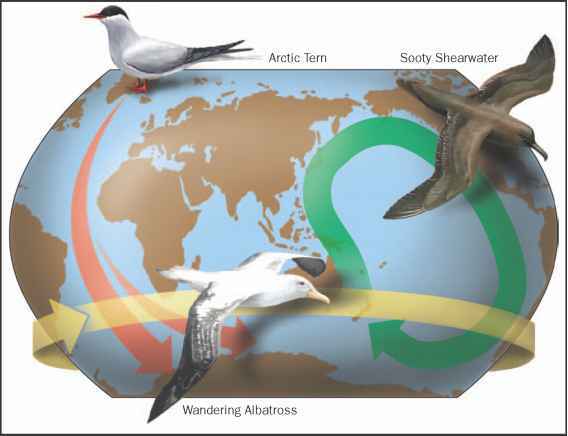 http://www.abcbirds.org (accessed on May 3, 2004). American Ornithologists' Union. http://www.aou.org (accessed on May 3, 2004). "Bird and Wildlife Information Center." National Audubon Society. http://www.audubon.org/educate/expert/index.html (accessed on May 3, 2004). BirdLife International. http://www.birdlife.net (accessed on May 3, 2004). "Birdlife Worldwide." Birdlife International. http://www.birdlife .net/worldwide/index.html (accessed on May 3, 2004). National Audubon Society. http://www.Audubon.org (accessed on May 3, 2004). National Wildlife Federation. http://www.nwf.org (accessed on May 3, 2004). The Nature Conservancy. http://nature.org (accessed on May 3, 2004). Ratites and tinamous are diurnal, meaning they are most active during the day. The exception is the kiwi, which is nocturnal, meaning it is most active at night. Behavior and reproduction varies between families. All lay eggs in nests but there the similarities end. In tinamous, rheas, cassowaries, kiwis, and emus, the males incubate (sit on to keep warm) the eggs and raise the young chicks. 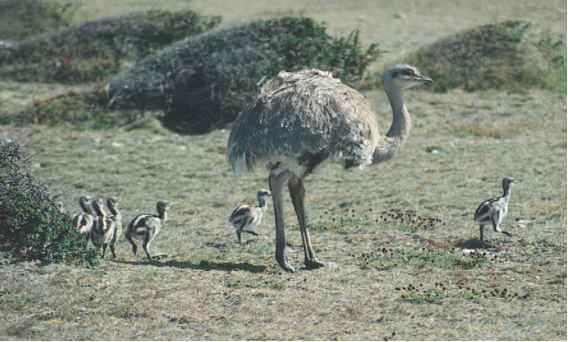 In ostriches, the males sit on the eggs at night and the females during the day. Ostriches are the largest living birds and live in flocks, families, and individually. They are diurnal, meaning that they are most active during the day. Ostriches can run at speeds of up to 45 miles per hour (70 kilometers per hour). Males are polygamous (puh-LIH-guh-mus), meaning they take more than one mate at a time. Ostriches have an average of thirteen eggs per nest, and a number of females will lay their eggs in a single nest. The eggs take about forty-two days to hatch. On average, only one chick per nest will survive to adulthood. Emus are the largest bird native to Australia. They live in pairs and are nomadic, following the rain to feed. The female lays a large, thick-shelled, dark green egg. When a nest has about eight to ten eggs, the male incubates them, meaning he sits on the eggs to keep them warm until they hatch. Kiwis are shy, night birds with a keen sense of smell. They pair up for life and are monogamous (muh-NAH-guh-mus), meaning they have a sexual relationship with only one partner. The female usually digs a nest in the ground where she lays one or two large eggs, weighing about 1 pound (0.45 kilogram) each. Rheas are the largest birds in South America. They are polygamous. During breeding season, the male rhea builds a nest in which between two and fifteen females lay their eggs. Nests contain ten to sixty eggs. The male cares for the chicks for about thirty-six hours after they hatch. Cassowaries are solitary birds except during mating and the egg-laying period. Although they do not fly, they are good swimmers and fast runners. The female lays three to eight large dark bright green eggs in a nest that is incubated by the male. He cares for the chicks for nine months after they hatch. Tinamous are one of the oldest families of birds. They are very shy and are rarely seen by humans. The male builds a nest and two or more females lay eggs in it. The male incubates the eggs and soon after they hatch and leave the nest, he signals for new females to lay eggs. A ratite known as the elephant bird (family Aepyornithidae) of Madagascar was the largest bird known to exist. It reached a height of 10 feet (3 meters) and weighed up to 880 pounds (400 kilograms). Seven species of the elephant bird once existed and two survived into the first century. All are now extinct. The last species to survive was Aepyornis maximus, which became extinct around the year 1600 c.e. One egg of the elephant bird was so large it would take 150 chicken eggs to fill it.